The Gauldrons Campbeltown Malt Scotch Whisky tells the story of the eponymous dark, stormy coves on Campbeltown’s west shores, and literally means “Bay of Storms”. As you step onto The Gauldrons’ fine, clean sand, you also step back in time. Over yonder is where a spider building his web with great patience but great difficulty inspired King Robert the Bruce to try, try and try again, having been defeated by his enemies. 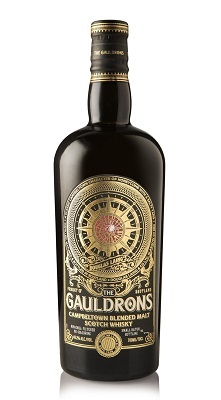 All around, you can sense the ghosts of the long lost distilleries that once proudly proclaimed Campbeltown Scotland’s Whisky capital.The Gauldrons is a marriage of the finest Campbeltown Malts, bottled in very small batches at 46.2% ABV, and proudly without colouring or chill-filtration.